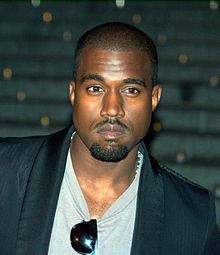 Kanye West, founder of GOOD Music. GOOD Music was founded in 2004 by Kanye West, in conjunction with Sony BMG. John Legend, Common, and West were the label's initial artists. Legend's Get Lifted (2004) was the label's first album release - this received eight nominations and three wins at the 2006 Grammy Awards, including Best New Artist and Best R&B Album. In October 2006, Legend released his second album, Once Again, which won a Grammy for the song "Heaven". In 2008, British singer-songwriter Mr Hudson was signed, following the release of his A Tale of Two Cities. There followed Kid Cudi, and manager Plain Pat. Kid Cudi's debut album, Man on the Moon: The End of Day was released under GOOD Music on September 15, 2009. The album earned three Grammy nominations and was certified Gold by the RIAA. A month later Mr Hudson's solo debut, Straight No Chaser, was released. Big Sean signed to the label in 2007. In late 2010, West released several tracks featuring himself, and others members of the GOOD Music roster, in a free weekly giveaway known as, G.O.O.D. Fridays. In September 2010, Brooklyn rapper Mos Def was signed. Shortly afterwards Consequence released a diss track and left the label. The following month Pusha T announced his signing. Late in 2010, Kid Cudi released his second studio album Man on the Moon II: The Legend of Mr. Rager, followed by West's fifth album My Beautiful Dark Twisted Fantasy. In April 2011, West signed American rapper and producer Q-Tip of A Tribe Called Quest. Kanye West also signed producer Hit-Boy, to Very Good Beats. In 2011, West signed Nigerian artists D'banj and Don Jazzy. In June 2011, GOOD Music signed their first distribution agreement, with Def Jam Recordings. Big Sean's debut Finally Famous was the first album released by GOOD Music with distribution by Def Jam. In 2015, Pusha T was appointed as the President of the label. In late 2011, plans were announced for a release of a compilation album, later entitled Cruel Summer. The album's lead single "Mercy", was released on April 6, 2012 and features verses from Kanye West, Pusha T and Big Sean, as well as GOOD Music affiliate 2 Chainz. The album was also preceded by the singles "New God Flow" and "Clique", the latter of which peaked at number 12 on the US Billboard Hot 100. It features West and Big Sean rapping alongside Jay-Z. Cruel Summer was released on September 18, 2012. It was accompanied by the eponymous short film Cruel Summer, which was shot in Qatar; the film premiered at Cannes Film Festival. The album debuted at number one on the Billboard 200. In January 2013, Scottish record producer and DJ Hudson Mohawke, announced that he had signed to the production arm of G.O.O.D. Music - Very Good Beats. On April 2, 2013, Kid Cudi announced on Power 106 that he was no longer with the label, leaving on amicable terms. Cudi felt he was "underused" and would have preferred to record something particular for Yeezus (2013). On June 29, 2013 producer Hit-Boy of Very Good Beats announced that his contract expired and that he was no longer signed to GOOD Music. American Apparel model Kacy Hill was signed to the label December 2014, after appearing as a backup dancer on West's Yeezus Tour. In March 2015, GOOD Music signed HXLT. In November 2015, West appointed Pusha T the president of GOOD Music. In January 2016, Mos Def retired from music announcing it in a freestyle released in conjunction with West's G.O.O.D. Fridays series. In February 2016, Brooklyn rapper Desiigner signed a record deal with the label and subsequently appeared on West's seventh solo album, The Life of Pablo (2016). On June 3, 2016, Kanye West announced GOOD Music's upcoming album, Cruel Winter, in an interview with Big Boy. On September 7, 2016, West announced that former Young Money/Cash Money Records artist Tyga, signed a record deal with GOOD Music. Later that day, Pusha T announced Atlanta-based rap trio Migos had signed a management deal with the label. However, in January 2017, Migos clarified that although there were discussions for a management deal, nothing had come to fruition. On September 9, 2016, the official GOOD Music Twitter account uploaded an image of an updated artist roster with the caption "THIS IS GOOD MUSIC". The image indicated that several artists had either left or been removed by the label, including D'banj, Malik Yusef, Ryan McDermott, and Mr Hudson. Later that month, in a radio interview with The Breakfast Club, John Legend announced that his fifth studio album, Darkness and Light, would be his last with GOOD Music. GOOD was advertised as one of the headlining acts of the ill-fated Fyre Festival in 2017; however, the exact member(s) of the label that were to perform were never established. In May 2017, Pusha T signed Francis and the Lights to GOOD Music. In February 2018, Valee signed with Good Music. G.O.O.D. Music also has a production wing known as Very Good Beats; this serves as a group of in-house producers. As of 2018, all releases are distributed by Def Jam Recordings, unless otherwise noted. Consequence Don't Quit Your Day Job! ^ a b "Pusha T Named President of G.O.O.D. Music: Exclusive". Billboard. Retrieved November 9, 2015. ^ Benjamin Chesna (September 26, 2012). "G.O.O.D. Music is Founded by Kanye West". The Complete History of G.O.O.D. Music. Complex.com. Retrieved December 3, 2013. ^ Benjamin Chesna (September 26, 2012). "John Legend's Get Lifted Becomes First G.O.O.D. Music Release". Complex.com. Retrieved December 3, 2013. ^ Benjamin Chesna (September 26, 2012). "John Legend Drops Once Again". Complex.com. Retrieved December 3, 2013. ^ XXL Staff (October 8, 2010). "GLC, I'm Still Down With G.O.O.D. Music But I'm Not Signed". XXLmag.com. Retrieved October 16, 2013. ^ Benjamin Chesna (September 26, 2012). "Kanye West Drops Late Registration". The Complete History of G.O.O.D. Music. Complex.com. Retrieved December 3, 2013. ^ Benjamin Chesna (September 26, 2012). "Big Sean Signs To G.O.O.D. Music". The Complete History of G.O.O.D. Music. Complex.com. Retrieved December 3, 2013. ^ McCormick, Neil (July 15, 2009). "Mr Hudson interview for Supernova with Kanye West". The Daily Telegraph. London. ^ "Kid Cudi Signs To G.O.O.D. Music — The Complete History of G.O.O.D. Music". Complex. September 26, 2012. Retrieved October 16, 2013. ^ "Kid Cudi Drops Man On The Moon — The Complete History of G.O.O.D. Music". Complex. Retrieved October 16, 2013. ^ "Mr. Hudson Drops G.O.O.D. Debut, Straight No Chaser — The Complete History of G.O.O.D. Music". Complex. September 26, 2012. Retrieved October 16, 2013. ^ "G.O.O.D. Fridays Series Begins — The Complete History of G.O.O.D. Music". Complex. September 26, 2012. Retrieved October 16, 2013. ^ "Mos Def Signs To G.O.O.D. Music — The Complete History of G.O.O.D. Music". Complex. September 26, 2012. Retrieved October 16, 2013. ^ "Consequence Releases "Man Purses," Ends His Run With G.O.O.D. Music — The Complete History of G.O.O.D. Music". Complex. September 26, 2012. Retrieved October 16, 2013. ^ "Pusha T Signs To G.O.O.D. Music — The Complete History of G.O.O.D. Music". Complex. September 26, 2012. Retrieved October 16, 2013. ^ "Kid Cudi Drops Man on the Moon II — The Complete History of G.O.O.D. Music". Complex. September 26, 2012. Retrieved October 16, 2013. ^ "Kanye West Drops My Beautiful Dark Twisted Fantasy — The Complete History of G.O.O.D. Music". Complex. September 26, 2012. Retrieved October 16, 2013. ^ "Q-Tip Signs To G.O.O.D. Music — The Complete History of G.O.O.D. Music". Complex. September 26, 2012. Retrieved October 16, 2013. ^ "Hit-Boy Signs To G.O.O.D. Music — The Complete History of G.O.O.D. Music". Complex. September 26, 2012. Retrieved October 16, 2013. ^ "D'banj and Don Jazzy Sign To G.O.O.D. Music — The Complete History of G.O.O.D. Music". Complex. September 26, 2012. Retrieved October 16, 2013. ^ "Kanye's G.O.O.D. Music Signs With Def Jam". Pitchfork. ^ "G.O.O.D. Music Signs Distribution Deal With Def Jam — The Complete History of G.O.O.D. Music". Complex. September 26, 2012. Retrieved October 16, 2013. ^ Matthew Perpetua (October 20, 2011). "Kanye Announces G.O.O.D. Music Album | Music News". Rolling Stone. Retrieved January 27, 2012. ^ "G.O.O.D. Music Drops "Mercy" — The Complete History of G.O.O.D. Music". Complex. September 26, 2012. Retrieved October 16, 2013. ^ "G.O.O.D. Music Drops Cruel Summer — The Complete History of G.O.O.D. Music". Complex. September 26, 2012. Retrieved October 16, 2013. ^ "G.O.O.D. Music Covers Complex's August/September 2012 Issue!". Retrieved July 1, 2016. ^ "Cruel Summer Debuts at No. 1 on Billboard's Rap Chart — The Complete History of G.O.O.D. Music". Complex. September 26, 2012. Retrieved October 16, 2013. ^ Cooper, Roman (January 20, 2013). "Hudson Mohawke Signs To G.O.O.D. Music's Very G.O.O.D. Beats". HipHopDX. Cheri Media Group. Retrieved January 24, 2013. ^ Ernest Baker (April 2, 2013). "Kid Cudi: "I'm No Longer on G.O.O.D. Music"". Complex. ^ "Hit-Boy No Longer Signed To G.O.O.D. Music". Vibe. June 29, 2013. Retrieved October 16, 2013. ^ "G.O.O.D. Music Signs Former Kanye West Backup Dancer Kacy Hill". billboard.com. December 17, 2014. Retrieved August 6, 2015. ^ "Punk Rocker HXLT Talks Debut Album, His G.O.O.D. Music Signing & Working With Kathleen Hanna". Retrieved May 13, 2017. ^ Brennan, Collin (January 20, 2016). "Yasiin Bey (Mos Def) announces retirement from music and film". Consequence of Sound. Retrieved February 21, 2016. ^ a b "Kanye West Signs Tyga & Migos To G.O.O.D. Music". Retrieved May 13, 2017. ^ "Tyga Wants to Make Something Clear About His G.O.O.D. Music Deal". Retrieved May 13, 2017. ^ "Migos Are Not Signed to G.O.O.D. Music - XXL". XXL Mag. Retrieved May 13, 2017. ^ a b c d e f Bankole, Taofik (September 10, 2016). "G.O.O.D Music finally confirms D'banj's exit". TheNET.ng. Retrieved February 20, 2017. ^ a b "John Legend Confirms End of Five-Album Deal on the Breakfast Club". It's a five-album deal with GOOD Music and [Darkness and Light] is my fifth album. ^ "G.O.O.D. Music Will Headline the First-Ever Fyre Festival". Highsnobiety. January 5, 2017. ^ "Valee signs with G.O.O.D. Music". thefader.com. ^ Cowen, Trace William (March 20, 2018). "Sheck Wes Drops "Do That" and Reveals He Was Supposed to Be in Wyoming With Kanye". Pigeons & Planes. Retrieved June 3, 2018. ^ "GLC, "I'm Still Down With G.O.O.D. Music But I'm Not Signed." - XXL". XXL Mag. Retrieved May 13, 2017. ^ "Tony Williams' Ain't No 'Fool,' Plans To Release Debut Album Independently". Soulbounce.Com. Archived from the original on January 26, 2013. Retrieved October 16, 2013. ^ "Tony Williams of G.O.O.D. Music Talks Most Memorable Studio Sessions With Kanye and Saint Pablo". Complex. April 19, 2010. Retrieved October 16, 2013. ^ http://hiphopdx.com, HipHopDX -. "Common Explains G.O.O.D. Music Departure, Kanye West's Focus Being Elsewhere". Retrieved May 13, 2017. ^ "Consequence Says He's 'Not A Part Of G.O.O.D. Music'". Retrieved May 13, 2017. ^ "Hive Five: Kanye West's G.O.O.D. Music Mistakes". Retrieved May 13, 2017. ^ a b "Kanye West unveils new song 'God Level', feat. Hud Mo and more". Fact Magazine. May 24, 2014. Retrieved February 20, 2016. ^ "[Watch] Benny Cassette – Raging Bull". AFRSH.com. Retrieved 2014-08-06. ^ Howard, Ty. "CyHi The Prynce f/ Kris Stephens – Lives [Prod. by Boogz & Tapez]". Fake Shore Drive. Retrieved July 24, 2017. ^ http://revolt.tv/video/its-going-to-be-a-g.o.o.d.-summer-with-charlie-heat/1E672DA4-89EB-4F5E-BCDC-37E0FA708BF4 (April 15, 2015). "It's Going To Be A G.O.O.D Summer With Charlie Heat". REVOLT. ^ "dom$olo". SoundCloud. Retrieved July 24, 2017. ^ "Evian Christ signs to Kanye West's G.O.O.D. Music". Consequence of Sound. ^ Makarechi, Kia (January 18, 2013). "You'll Be Hearing A Lot From This Man Soon". Huffington Post. ^ "Fun. Producer Jeff Bhasker Caps Big Year With Grammy Nods". Retrieved May 13, 2017. ^ Vasquez, Andres (April 6, 2012). "G.O.O.D. Music's "Mercy" Producer Lifted Speaks On Kanye West & More | Get The Latest Hip Hop News, Rap News & Hip Hop Album Sales". HipHop DX. Retrieved October 16, 2013. ^ "A$AP Rocky Addresses Kanye West Producer's Criticism". Retrieved May 13, 2017. ^ "Meet Mitus, the 20-Year-Old Making Beats for Kanye, Rihanna, Lorde, and Pretty Much Everyone Else". Noisey. Retrieved May 13, 2017. ^ Weiss, Jeff (May 20, 2015). "Def Jam Executive No I.D. Is Behind Probably Half Your Favorite Rap Tracks". Retrieved May 13, 2017. ^ a b HipHopDX (January 20, 2013). "Hudson Mohawke Signs To G.O.O.D. Music's Very G.O.O.D. Beats". HipHopDX. ^ "Kanye West – Graduation [Credits] Lyrics". Genius. Retrieved July 24, 2017. ^ "Devo Springsteen Interview". DJBooth.net. June 11, 2007. Retrieved February 26, 2011. ^ "Don Jazzy Confirms His Contract with GOOD Music Is "Finished"… D'Banj Too?". 36NG.com. August 23, 2013. Retrieved August 6, 2015. ^ "G.O.O.D. Music producer Keezo Kane interview with Gowhere Hip Hop". Chicago Now. March 9, 2010. Retrieved February 26, 2011.